The Spice Route Gets Hot! November 7th: Now after the last end of the section I had a blog to write at the end of this section, this time I have had many to write including adventures with Princess Safari’s. But the spice route definitely got ‘hot’ there was plenty of love and romance and if you were on the truck and reading this you know what I’m talking about!! We even lost a person to “homesickness” half way through! But drama aside it was an amazing second leg to our Africa adventure and it would not have been the same without the folks onboard our trusty truck Imani! We lost a few folks in Victoria falls mostly the scandanavian-esque contingent went there separate ways the dutchies - Saskia, Linda and Tilly, the Swedes – Jospehine, Sophia, Sophie and Johann and last but not least the Spaniard Anna. So or the next leg we have our compadre’s from the first trip Dana (Oz) And Mark (Scottish). Then staying on from the second was the two yanks Carly and Adam, Ed the Brit and finally the Danes Sophie and Morton. The new folks joining in Victoria Falls we had, Gaz the Welshman (say no more), Jo the English Policewoman (say no more), Martin the Austrian, Steve and John, Scotsmen from the Isle of Skye and the lovely Italians Andrea (yes a bloke) and Evelyn. This group got older with a new mix of nationalities and experience….lets see what the next 3 weeks bring! 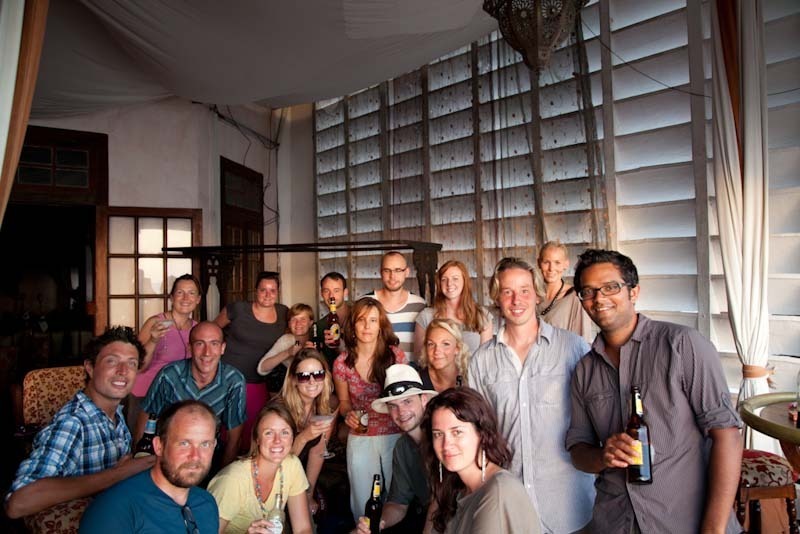 A group photo from the second leg, Africa House on Zanzibar, amazing cocktails and sunset…Excuse the framing of the shot the gentleman who took it was obviously a bit drunk!